Disability rights advocates sometimes point out that "it's really very simple." At other times we point out that "it's not so simple," stressing that simplistic arguments will lead to wrong conclusions. Bodies In Revolt by Ruth O'Brien. Routledge, 2005. Softcover, 198 pages. $24.95. 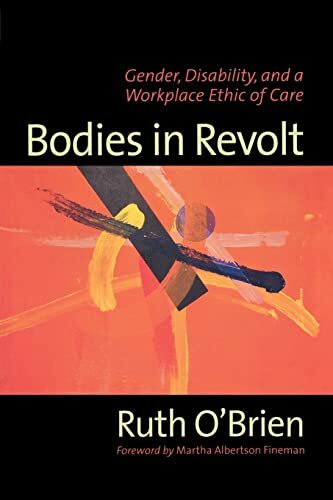 The arguments in Ruth O'Brien's Bodies in Revolt: Gender, Disability, and the Workplace -- backed up with 832 explanatory notes and reference to theorists whose works are even denser, like Michel Foucault, Benedict Spinoza, Gilles Deleuze, and Felix Guattari -- hint at possible answers to the "simple" questions that confront us. Complex answers. O'Brien is Professor of Government at John Jay College of Criminal Justice and Executive Officer (Chair) of City University of New York's graduate program in Political Science, and her work related to the disability experience in America deserves our attention. In 2001 the University of Chicago Press published her Crippled Justice: the History of Modern Disability Policy in the Workplace. In 2004 Oxford University Press published her edited Voices from the Edge: Narratives about the Americans with Disabilities Act. (That very readable anthology included a first-person account by O'Brien "Cheaters and Copycats" that was included in the Disability Rag Reader 25.1). Bodies in Revolt is her latest book. In her headings and chapter titles -- "No More Rights, Please"; "Myths of Autonomy"; "A Reasonable Accommodations Model: Good for Goose and Gander"; "Overcoming Otherness"; "A Caring Union: All for One and One for All"; and "If Not Honey, What About Vinegar"; "A Subversive Act"; "The Life of the Body"; "An Alternative Ethic of Care"; "The Body at Work"; "Unmasking Control"; "Unions: Bridging the Divide"; and "Critical Care" -- O'Brien expresses discontent with "binaries" and "dualisms." Quandary No. 1: what are we talking about when we talk about "disability"? Whom are we talking about? O'Brien prefers the term "animality" to "disability", since it refers to universal human experience, and O'Brien says that "disability" needs to be understood as a universal experience. She discusses pregnancy, aging, and advances in genetic research (and possibility genetic discrimination), all of which call for a broad concept encompassing the human condition. Modern science keeps babies alive who would previously have died. It provides for genetic information while we are alive, and it extends our lives. Instead of the term "disability", which characterizes the "other," we should opt for "animality," says O'Brien, because that term reflects a universal human condition. Confusion might induce Peter Singer to join an "animality needs" movement, but aside from that, I'm concerned with the many people who wouldn't join, because they did not know about or understand the change in terminology; a substitute for "disability" would simply "vague it up" a lot. Rather than looking for a substitute for "disability," it seems to me that we need to be trying to figure out what we should be thinking about when we think about "disability." One of the virtues of a universal concept like "animality," of course, is that we would not have the problem of there being "nondisabled" people, since not having some actual or potential impairment would be almost impossible. In 2005, though, we have the problem of "what to call the non-disabled?" and the response "Use their names!" is only slightly less helpful than O'Brien's "the able-bodied." Though I like the abbreviation "AB", it's also used to describe the millions of Americans whose disabilities are not physical (and O'Brien's title might more accurately speak of "Bodies and Minds in Revolt," since this would better characterize feminist and workplace resistance.). I like "either-ors" as little as O'Brien does, but "disabled/non-disabled" will be more valuable than terms like "animalist" or "able-bodied" for the foreseeable future. Fortunately, O'Brien retreats from her idea of substitution by continuing to use "disability" in her subtitle and in most of the book. Quandary No. 2: how do we move beyond talk to action? Another is its call not for abstract nondiscrimination but for accommodation, which can be particularly useful in the workplace, where it requires employers to engage in dialogue ("interactive process") with employees. This won't always be a smooth process, however. When O'Brien refers to "vinegar" in a chapter subheading, she's recognizing that workplace changes are unlikely to be made without a struggle. O'Brien argues that disabled workers are in an ideal position to form a kind of resistance movement. Campaigns to "hire the handicapped," though, have always given the unstated message of providing a compliant workforce; and since transportation, housing, access to social activities, and family relations are already battlegrounds, it's unrealistic to believe disabled people will be eager to take up another area for resistance. Labor rights and disability rights have seldom overlapped, but O'Brien contends that they should. Feminists and disability advocates, she says, should find common cause as well. O'Brien doesn't like "identity politics" . Nor do many of the authorities she cites. But I contend that such criticisms are based on a misunderstanding of "identity." (I wrote about this at http://www.Mouthmag.Com/issues/71/71_identitypolitics.Html). As O'Brien points out, feminist identity, labor identity, and disability identity have common ground, and affirming this should strengthen, not weaken, disability identity. Quandary No. 3: Independence, interdependence, or both? Although not hostile to arguments based on independence and rights, O'Brien argues that we should talk more about "needs" and "care." But how do we reconcile the former with the latter? Disability scholar and historian Paul Longmore contends that in the second phase: from disability rights to disability culture, society will undergo a fundamental shift: "The affirmation of disabled values," he writes, will also lead to a broad-ranging critique of non- disabled values. "American culture is in the throes of an alarming and dangerous moral and social crisis, a crisis of values," he contends; "the disability movement can advance a much-needed perspective on this situation. It can offer a critique of the hyperindividualistic majority norms institutionalized in the medical model and at the heart of the contemporary American crisis." O'Brien recognizes the moral and social crisis; but her answer to it focuses on theorists' speculations rather than on "disabled values." Her discussion of "care" builds on feminist thinking which acknowledges the ever-presence of politics, the artificial separation of "personal" from public issues, the importance of "concern for the vulnerable" and the necessity of a process that is "discursive," taking particular circumstances into account. Her ultimate vision emphasizes "needs not care," and acknowledges that "benevolence smacks of paternalism." But I think disabled people used to an inferior status as "the caregiven" will I bristle at "care"'s centrality in O'Brien's argument. "Care" that's universal and reciprocal is pretty much "pie in the sky," as far as most disabled activists are concerned. Quandary No. 4: "Ought," "is" or "can"? O'Brien focuses on the "ought" far more than on the "is" or "can" -- on theory far more than practice. Though she passionately argues that feminists and labor and disability activists should make "real world" use of the ADA (and voices concern that opponents of disability rights share her characterization of the law as "radical"), she says they needn't be afraid -- because her argument is "utopian," far removed from everyday realities. Such contradictions make Bodies in Revolt a frustrating book. We all need to be frustrated sometimes. Sometimes it makes us take action. But had I picked up O'Brien's book a month or two later (when I was busier) I would have put it down soon thereafter. It's a tough read, and the quandaries it explores are addressed more directly in her previous titles. And it invites a "dream on!" response. Disabled people should be revolting. They should be providing the "vinegar" of workplace resistance that O'Brien hopes for. But voters with disabilities helped reelect George Bush in 2004. So we probably have a long way to go. I hope Bodies in Revolt will cause people to see commonalities among feminism, the workplace, and disability issues. We need to connect utopian notions with social action, and. O'Brien's writings can provoke us to do so. Art Blaser, a frequent reviewer for Ragged Edge, chairs the political science department at Chapman University. Read his review of Ruth Colker's The Disability Pendulum. Interesting article.Too bad you do not have a button here for me to e-mail to others who may be interested in this.